Is it a bird? Is it a plane? No – it’s a police box VWORP-VWORP-ing through the temporal vortex, with a caped superhero swooping alongside! When we last saw Grant, Lucy and Jennifer in The Return of Doctor Mysterio, they were settling down together as a family – and Grant’s superhero costume was safely stored away. But that wasn’t the end of the story! Now, the Doctor is swooping back into their lives – because the alien gem that gifted Grant his powers has counterparts all over the universe. It’s up to the Doctor, Grant, Lucy and Jennifer to track them all down – to prevent cosmic disaster! Writer George Mann teams with artists Ivan Rodriguez, Pasquale Qualano and Dennis Calero to bring you all-new superhero adventures with the Twelfth Doctor…! 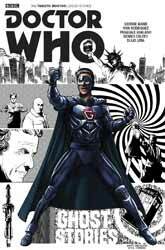 I didn’t have very high hopes for the Christmas 2016 Doctor Who episode The Return of Doctor Mysterio, fearing that the British television show’s attempt to enter the world of the American comic-book superhero would be about as successful as The Gunfighters had been at doing a Western. When I watched it, however, I was pleasantly surprised by Steven Moffat’s understanding of the genre and the level of on-the-nose wit, particularly with regard to the mythology of Superman. Why, then, do I feel so indifferent about this comic-book sequel to that episode? Well, for a start it’s not very ‘comicy’, despite actually being a comic strip. There are lots of text panels, talking heads and rather static action, especially during the opening chapter. The irony is that the television episode represents comic-book superheroes better than this comic book does. There are some dramatic bits of dialogue that successfully encapsulate the genre, the prime example surely being Grant’s defiant, “This stops. Right now.” On the other hand, there are some really sappy thought panels, which convey Lucy’s stream of conscious throughout the story. “And that’s when it hits me,” she tells us at one point, “Being a hero isn’t just about finding the strength to act in the moment. It’s about having the heart to do the right thing.” Pass me the sick bag, please. Frequently, these musings battle for the reader’s attention by alternating with what is said in the speech balloons. “That safe little bubble you’ve surrounded yourself with…” Lucy thinks. “The only thing that’s going to end today…” says a supervillain called the Smoke. “…is about to burst forever,” adds Lucy. “…is you,” concludes the Smoke. Distracting, isn’t it? This is, unfortunately, something that superhero comics have a habit of doing, and I tend to find it rather annoying. The plot takes the form of a search for powerful gemstones, which are needed in order to save the universe as we know it – so a bit like the Key to Time, then. With four chapters (this story was originally released across four monthly issues in print) and three stones to find, this leads to an unusual story structure, which switches to a new setting about halfway through each episode (though the digital version of the serial was split into eight instalments, the changes of location coinciding with the ends of #1, 3, 5 and 7). In each location, the Doctor, Grant and co encounter a different enemy – though how each one is defeated is decidedly lacklustre, involving various quick and easy combinations of sonic screwdriver waving, crystal removal and just talking to people. The artist changes with each chapter, beginning and ending with Ivan Rodriguez. As previously mentioned, there isn’t much of a sense of action during the opening instalment, and Rodriguez’s rendering of Peter Capaldi’s Doctor is a bit too plump in the face. The age of Lucy’s daughter Jennifer changes during the course of the narrative. The opening instalment establishes that she is eight years old, and that amount of time has passed since the events of The Return of Doctor Mysterio. However, the girl depicted by Qualano appears to have recently entered puberty, and subsequent textual references indicate that Jennifer is eleven. The best likenesses of the television characters are to be found in the third episode. The still-frame, photo-reference-reliant style of Dennis Calero is comparable to that of Paul Crompton, who provided the (often quite freaky and horrific) artwork for several Doctor Who annuals featuring the Fourth Doctor. Calero (as I also imagine Crompton would have been) is a good choice of artist to realise the creepy, bone-and-sinew look of the alien Sycorax, who return in this instalment. The excitement level increases from this point on, and the returning Rodriguez gives us some nicely detailed views of the Sycorax ship from the vantage points of four different planets. Writer George Mann provides a moment of genuine shock (which I won’t spoil for you) and colourist Dijjo Lima turns up the special effects, which include huge explosions in space, coruscating waves of energy, and a dramatic camera-zoom effect for the aforementioned surprise. So I did ultimately enjoy Ghost Stories, or at least the conclusion of it – but there were several times during my reading of this graphic novel when I almost gave up the ghost.